Editor’s Note: This article was originally published on Pixelkin.org as part of their E3 Coverage. They are another site that reviews games for families much like us. Check them out when you get a chance! Electronic Arts held their E3 Play press event on June 12th, 2016. They brought a new trailer for Madden NFL 17 as well as information regarding significant updates to the game’s Franchise Mode. The most significant update comes in the form of the “Play the Moments” feature. This works by giving players in Franchise mode the chance to take the helm at critical moments throughout the game, while simulating the rest. Focusing on critical red zone drives, key third down stops on defense, and late game scoring opportunities will keep the games moving and will let players complete a season over the course of a weekend. The updates aren’t all on the field though. There are improvements between games as well. Players will be able to use Franchise gameplanning to help tailor their strategy to help take advantage of their teams’ strengths or their opponents’ weaknesses. This influences practices in between, and play selection during, each game. The Big Decisions system also allows players to take on the role of a General Manager for their favorite team and decide when to bring players back from injury, signing free agents, and even negotiating contracts with players. This is an unprecedented level of control for players and, if implemented correctly, might even give some insight into the decisions some of our favorite teams have made over the years. These sure are big updates, but don’t just take my word for it. Take a look at this video from Mike and Mike (of ESPN Radio fame) where they lay it all out on the table. The bottom line? Madden NFL 17 looks stunning and includes some highly sought after feature updates. This is going to be a great year to be a Madden fan! A review copy of the game was provided gratis by Activision to facilitate this review. Transformers: Devastation is simultaneously the best and worst game I have played in a very long time. This might sound like I am conflicted, but I’m really not. These aren’t two forces pulling in separate directions and threatening to tear my enjoyment apart like an old axle. No. Instead these are two opposite forces that held me suspended in a warm pool of 80s nostalgia for every minute that I played this game. It was glorious and heart wrenchingly bad in equal parts; a perfect expression of the 80s. Let me make one, rather large, disclosure before I get going on this review. I am one of the bigger Transformers fans on Earth. In fact, my love of Transformers has influenced my love of all things mecha. If it is a giant robot, then you can bet that I will love it. Some people might read that and question if I am the right man for the job. How could my Transformers bias not get in the way of a fair review? That’s a good question, and this is the best answer I can give you: Transformers: Devastation was made for superfans. Every decision that Platinum Games made was laser focused on exciting people like me and making us buy this game and play it. The “average consumer” might not necessarily be drawn to this game in the same way. This makes me the perfect reviewer because, to be frank, I don’t know to many other people who would find value in this game other than the super fans. At its core, Transformers: Devastation is a stylish action game in the vein of Bayonetta or Devil May Cry. The difference here is that instead of over the top gore and violence Transformers expresses that action using cartoon robots battling each other in melee combat. There are guns involved, but they are largely an afterthought. Instead, we spend our time fighting using swords, axes, hammers and fists and forming interesting combos that can be extended by using a simple button press to transform into vehicle mode and crash into the enemy. The game is, basically, an episode of the 80’s cartoon show extended and put into video game form. This includes things like several of the original voice actors, the original animation style, and even sound track beats that were reminiscent of the series. Saying that something is a “love letter” to fans is a rotten cliche but it works here. Playing this game turned me from a man in my mid thirties to an 8 year old in my pajamas watching Saturday morning cartoons. This has all been glowing right? Where are the bad parts? What made it the worst game I had played in a while? Well, here they are. I am going to be short and to the point about them because if you are a superfan (like me) then they probably won’t matter). Difficulty – Some of the boss fights are mind numbingly difficult. This can be overcome by setting the difficulty lower, but when your third boss is Devastator you don’t really have much to do other than make it hard. Repetition – Some of the environments are reused ad nauseum. Granted, I didn’t notice much because I was too busy enjoying punching robots. Short story – I am not criticizing the quality of the narrative. Its an episode of Transformers so I don’t expect much. With that said, I DO have something to say about the length of the game. I finished the story in about 7 hours or so. If you are someone that wants to replay sections to get higher scores, then it would extend the game. But, there just wasn’t enough time spent punching robots. This is an action game that involved melee combat and guns. With that said, the combat is 100% robot on robot. The city that the games takes place in has been “evacuated” so there aren’t any people at all. If you would let your kids watch an episode of Transformers on TV then this will be more than fine. The action in Transformers: Devastation is all based on time button presses being used to form combos. This rewards skilled players who can have command over the different buttons on the controller. You can just press one or two buttons though so “button mashing” on lower difficulty levels will work. Some of the bosses are very difficult, but the checkpoint system is generous. If you or your child are easily frustrated though, then this is something to pay attention to. If you are a Superfan then this is a must buy. Stop whatever you are doing and go buy the game right now. If you are not? Then this is a game to look forward to if you really enjoy stylish action games like Bayonetta. Otherwise you can skip it without really missing anything. Madden 16 is going to be a big game this year. (Read our review here!) Take a look below to see what songs will be on the sound track to see if there are any songs that concern you. I have also included the Spotify playlist so you can give it a listen. Football season is almost upon us and with it comes a new iteration of the longstanding Madden franchise. John Madden Football is the Marshawn Lynch of video games. It is virtually unstoppable. The only real question is whether the game is very different from the last one. Electronic Arts only has a year between games so a massive overhaul is never in the cards. The good news for longtime fans of the series is that Madden 16 includes some subtle changes that help enhance the game and make it emulate the NFL game more fully. This biggest change is found in the passing game. Quarterbacks have more control over their throws. Holding the right and left bumpers and triggers on the controller will place the ball either low (and away from the defender) or high (to get those back shoulder fades just like Aaron Rodgers). Receivers can be controlled in such a way that they can either aggressively leap towards the ball, position themselves for a run after the catch, or secure the ball. These options can be ignored, but they do give players more fine control over the game. Defenders have options too. You can hold a button to have them make a play on the ball. This will help them jump routes for interceptions or punch the ball out on jump balls. Good timing will give you a better chance to turn things to your advantage. They did introduce the new Draft Champions mode where you are taken through 15 rounds of a draft where you are asked to choose between three existing players of various positions. It is a fast way to draft a new team and play against people without using existing teams. The interesting part of this mode is that round 15 is a “legend” round that will include players like Randall Cunningham, Jerry Rice, and others. It is definitely an interesting way to play the game. The rest of the changes are essentially interface tweaks and graphical improvements. The franchise mode is, sadly, still lacking some of the depth that I would hope to have, but we can always hope for next year. Do you let your kids watch NFL games? Is so then the offline play modes in this game will not be an issue. The standard warning regarding online play stands here. The average player online will be vulgar at best. If you do not want to risk exposing your child to foul language and other “interesting” things you should either shy away from online play or mute voice chat. The soundtrack is definitely relevant as well. We published the song list in a separate article as well as the Spotity playlist here. 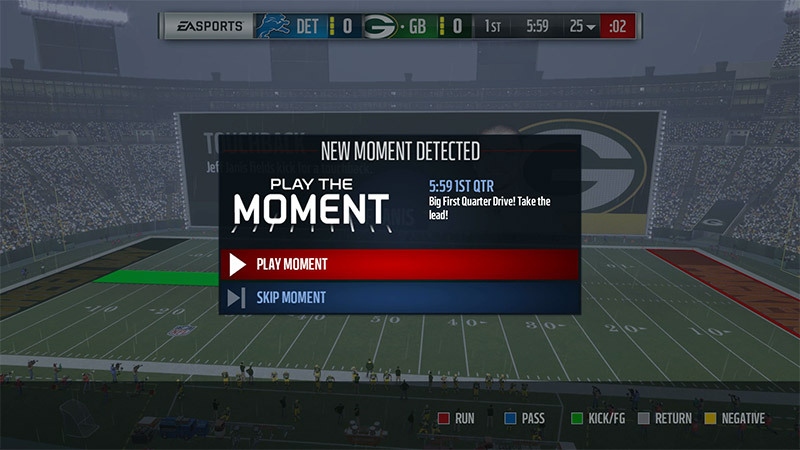 Madden 16 is a sports simulator game so it is very difficult. Even the rookie difficulty will be challenging for players who do not have a strong understanding of the fundamentals of NFL football. It is not impossible to learn the game (frankly, everyone had to learn once), but players should have strong reading skills to read the menus and advice and it is advised to spend a lot of time in the skill drills before playing a game. Madden stands alone as the only NFL game on the market, but it does not rest on that exclusivity very much. It is a very good game that is a great way for families that love the game of football to share that enthusiasm. We learned something very interesting during the 2015 Microsoft E3 press event. I learned how to properly pronounce the name for the Swedish company that makes Minecraft. I mean… I learned a lot of other useful stuff to. I learned about Halo 5. I learned that the Xbox One will be backwards compatible with the Xbox 360. I even learned that Rare is releasing a collection of thirty classic games for $30 (HUGE VALUE). But, the thing I learned that will have the single biggest impact on my life? This is critical knowledge for everyone with a child between the ages of 5 and 15 so lets spread the word people! MO-YANG; Not MO-JANG.